Mysteries have a certain allure. They can provide a sense of purpose if you’re the one playing detective. They can provide a mission. This documentary is the story of 3 men trying to discover the origin of some mysterious tiles that appeared on the streets of Philadelphia – and then up and down the East coast – beginning in the early to mid 1980s. 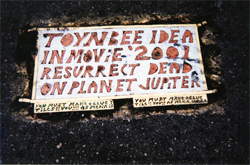 Along with other random, cryptic text, the tiles all said, “Toynbee idea, in movie 2001, resurrect dead, on planet Jupiter”. Certainly the kind of crazy talk that can pique a person’s interest. Who is laying these tiles in the streets? How are they doing it? Does it matter? Should I care? Most probably wouldn’t. Or, if they did care, they wouldn’t take the time to try to solve the mystery. But, as is pointed out in the film, Justin Duerr isn’t exactly like most people. He is driven to see things to the end, so once this mystery had him in its clutches, he wasn’t going to let it release him. That’s what the movie is about on the surface, but like the tiles, there’s more lying below the surface. What I found most interesting was how some people – or maybe all people – need a mystery or mission in their life in order to feel like they have a purpose. The person behind the tiles has invented a great truth along with a sort of conspiracy which must be brought to the world’s attention. Meanwhile, Justin Duerr has let the mystery of the tiles consume his life in a similar way. It has given him a reason to be, which is something I think everyone can appreciate. I like mysteries. I like people that try to solve mysteries. And I liked this movie. It’s not an all time great, but if you’re interested in oddities, mystery, and amateur detective work, you might find it fascinating. Oh, and never fear, the mystery is actually solved (for the most part), so you don’t have to worry about being left hanging. In fact, it might feel a little underwhelming when you really think about it afterward. The whodunit aspect turns out to be less surprising than the howtheydunit and whytheydunit aspects. Though, the whytheydunit is still a little hazy. It’s not monumental subject matter, there aren’t many holy-cow moments, and I was a little curious at times as to whether I was watching events unfold as they happened or if it was some sort of recreation of events, but all in all, I enjoyed it. A lot of sports related people, as themselves. Scott Turow: It’s like the guy who’s been divorced six times but still believes in love. That’s just what it is to be a Cubs fan. Documentary examining two specific plays in sports history – Steve Bartman interfering with a foul ball in the stands at a Cubs World Series game and Bill Buckner’s error for Boston in the 1986 World Series – and how those plays, and individuals, were used as scapegoats for the respective organizations’ general futility. Have you ever had 40,000 people chanting “Aaaaaassshoooole” over and over at you in unison? Were some of them also hurling various foods and beverages at you while verbally threatening your life? You’d think the person receiving that treatment would have just blown up a bus full of school children perhaps, but you’d be wrong. No, this person’s heinous crime was trying to catch a foul ball at a baseball game. With a 3-0 lead in the 8th inning, 5 outs away from the Cubs winning a World Series title that would break a supposed curse that stretched back over generations, Steve Bartman (and several other fans) reached out to catch a foul ball that Cubs outfielder Moisés Alou was also about to make a play for. Bartman deflected the ball, giving the Florida Marlins batter another chance, and what followed was an 8 run inning for the Marlins, a horrible night (and series) for Cubs fans, and a nightmare of a life for Steve Bartman. But Bartman didn’t allow any of those 8 runs to score. The Cubs players did. Bad pitching and bad fielding were really to blame, but that’s where the concept of a scapegoat comes into play. All of the fans’ and team’s troubles were heaped on the shoulders of this one man. He had no choice but to disappear from the public eye. You won’t see him in this documentary (other than the footage of him from the game itself) because he’s darned near impossible to track down. That’s a good thing though because I’m sure there are still some Cubs fans that would love to take out their frustrations on him. It’s a different story with Bill Buckner though. Evidently his supposed sins have been absolved by the Boston Red Sox fans, mostly because they’ve won a couple of championships in recent years. There’s a very touching scene where we see the moment that Buckner finally came back to Finley park and was received with thunderous applause. It’s just a pity that it took so long for fans to realize that Buckner alone wasn’t to blame for the outcome of that infamous Game 6. Nice to see him hopefully close the door on that portion of this life though. It obviously hasn’t been easy for him or his family. This is a slightly overlong documentary that has some nice moments but pads itself out with a lot of repetition. They must show the Bartman play about 100 times, and while some of the analysis is interesting, it does grow tiresome after a while. I wish the movie had concentrated more on the concept of scapegoats, as it does for a short time near the end. 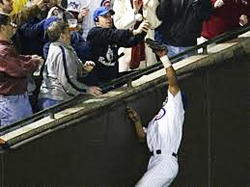 I think it would have been interesting to hear from a lot of Cubs fans as to whether or not they still blame Bartman, or if they realize how he was being used as a scapegoat. Instead, the bulk of the movie is analysis of the two plays and the events surrounding them. That stuff is sort of interesting, but not interesting enough to stretch to an hour and 42 minutes. I think it could have been covered in at least a half hour less time. Still, I learned some things about the two situations that I didn’t know before, and it was entertaining enough. And hopefully one day the Cubs will win a World Series and Steve Bartman will finally be able to show his face in public again. Until then, he’ll just be that guy who ruined everything for everybody…unless you’re a Marlins fan, in which case he’s probably your hero. Exploding a baseball and then boiling it into spaghetti sauce is a sure fire way to break a sports curse. Sarah: They’re blind…they track sound. You’re louder. Sarah (Macdonald), the lone survivor of a caving expedition that was attacked by subterranean creatures, is forced to assist a rescue team search the cave for possible survivors. This little rescue attempt does not go well. Throw another one on the pile of unnecessary sequels. This one is probably a touch better than most uncalled for sequels, but it still reeks of a lame attempt to cash in on the unexpected popularity of the first movie. Sadly, the writers, and first time Director Jon Harris, didn’t quite understand what made the first movie an enjoyable horror flick. That movie really gave itself time to develop the characters and create an ominous feeling of the cave closing in around them (and us the audience). In an odd way – despite what happens to them – the first movie seemed to actually care about the characters. Part 2 simply reduces them all to ambulatory bags of blood just waiting to be torn apart in creative ways. The movie opens with one of the most stunningly unbelievable setups I’ve seen in a long time. Sarah has just been discovered, she’s recovering from her ordeal in the hospital, she has her friends blood on her clothes, and somehow the policeman in charge decides it’s a good idea to drag her back down into the cave? Don’t question her for more than 30 seconds, don’t do a full investigation or get a psychologist in to talk to her for a while. Nope, just take the only survivor from the entire party back down in the cave. Under no circumstances could I ever see this happening. Ever. At least when they pulled that stunt in Aliens, Ripley had told her story numerous times and a long time had passed before she went back into the monsters’ lair. While Part 2 does manage to create some scary caving experiences (the scariest aspect of the first movie), it rushes to get to the monster attacks. If you like extreme gore, I guess that will make you happy, because the attacks are pretty disgusting. But it’s all so empty. Just an exercise in violence and special effects. I did say this was a touch above most bad sequels, and that’s mostly because of Shauna Macdonald. She’s still an enjoyable actor to watch, and since she had a lot of character development in the first movie, she’s the only one I felt any connection to. The caving sequences leading up to the monster attacks are good, and some of the action is alright. Unfortunately, just when you think it might end on a good note, the movie totally falls off the deep end. I really disliked the end of this one. The first movie, depending on what version you saw, ended in a sort of poignantly depressing way. This movie just left me feeling bad as the credits rolled. One last thing to note. The Descent was understandably guilty of having some of the caves lit with an unrealistic amount of light. I mean, you have to if you want to see anything in a cave. Part 2 goes overboard with the unrealistic lighting. Way overboard. You can see plain as day in some caves where there shouldn’t be a single light source. Part of what’s scary about being in a cave is how dark it is. Leave the 10K at home next time guys, okay? Don’t fire a gun in a cave. Mark: I built Marwencol for me…for my therapy…and now it’s like everybody’s. Like everybody wants to play in it or be part of it, and I don’t want all that. After he was severely beaten by 5 men, a down on his luck alcoholic, Mark Hogancamp, couldn’t remember anything from his life before that day. 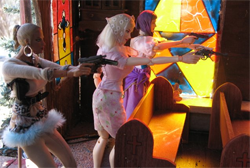 After relearning how to do basic tasks and to live on his own, he began to create a fantasy world that he could feel safe in by constructing a town called Marwencol and filling it with dolls that represent people he meets in his real life. If Charlie Kaufman was God, these are the kinds of people and situations he would love to spend his days creating. In fact, in Kaufman’s Synechdoche, New York, the main character, Caden, does do something a little bit like what Mark Hogancamp did in real life. He creates a virtual world that represents his real life. In both cases, the characters in the fantasy world usually go through exactly what the real life person had to suffer through. It’s a form of therapy for Hogancamp, and he’s well aware of that. In fact, by the end of the movie, his 1/6th size doll counterpart is constructing a miniature city of his own after having suffered a severe beating. I’m not sure how much further that Matryoshka Doll-like scenario could be carried out by Hogancamp, but in Synechdoche, New York Caden just kept going and going with it until there was seemingly no longer any reality for him. Hopefully Hogancamp won’t need to dive that deeply into his fantasy world. As for the movie itself, it starts off fascinating and ends with some good emotional moments. Only in the middle did it drag a bit for me. The models that Hogancamp has built are amazing, but there’s only so many photos of them I can look at before it gets a little tedious. Don’t get me wrong, it’s not torturous, it just wears a little thin. I would have liked to see even more interviews with people that knew Mark before and after his memory loss. The more I learned about him, the more interesting his fantasy world became. And believe me, there is plenty to learn about him. He may be a bit strange (borderline depraved at times), but by the end of the movie when he’s getting ready for his gallery show, you will almost definitely find yourself rooting for him to overcome his fears and start socializing with people who aren’t 8 inches tall and made of plastic. Amnesia can be an effective cure for alcoholism. A bunch of parking lot attendants. Tyler: To work there, you have to have a certain disregard for the people because otherwise you could fixate on the fact that, UVA being a fairly good school, you have to imagine that maybe 80% of those people will graduate…and all the people who graduate, for the most part, are going to make more money in a year than I will in my entire life. Not only that, many of them are going to be sending MY children to wars on other planets. And not only THAT, but they all just vomited on a Buick. A documentary looking at the lives of a group of parking lot attendants working at a small parking lot in Virginia. It’s amazing, the places you can find interesting people and interesting stories. You just have to look for them. I’m not sure if director Meghan Eckman went looking for this story though. My guess is that in her time studying at UVA, she either parked in this lot on more than one occasion or just met some of the guys who work there. Heck, she could have been taught by one or more of them, considering the fact that some of these guys were instructors at the university. That’s one of the interesting things about the group of attendants we meet in the movie. The jobs many of them had before they worked there and the jobs they have after working there make the choice to work there a strange one. They freely point out that most of them are over-educated/overqualified to be sitting around in a parking lot all day, but for some reason they were all drawn to the job. Even though these guys are generally bitter and hate everyone that parks there (and freely admit it), they’re still an amusing bunch. Their humorous and philosophical comments are the main entertainments to be found here. Let’s face it, the subject matter is not exactly deep, inspiring, and moving. In fact, after a while, I started realizing that it seemed like 30 minutes of subject matter was being stretched out over an hour and 10 minutes. “Okay, I get it, they hate everyone, don’t know exactly why they work there, but still love it,” I might have been heard to say…to no one in particular…since I watched this movie by myself. That’s not to say I was bored exactly. The amusing comments and arguments caught on camera were entertaining enough. It just never seemed to be going anywhere. Though, I guess that’s to be expected in a parking lot. Nev: I don’t really, necessarily want to be doing this. You’re choosing to do it. Nev: That’s what I tried the other day, and you almost fought with me about it. Rel: So stop right now. Just stop. Nev: What are you trying to do, like, basic reverse psychology on me like a six year-old? Rel: Yeah, so what are you giving me, basic laziness? Documentary following the relationship between a photographer, Nev, in New York and the family of a little girl, Abby, in Michigan who paints amazing versions of Nev’s photos. After months of getting to know the family via the internet and the phone, Nev, and the two filmmakers who share his office, start to uncover the fact that not everything is as it seems as far as the family is concerned. I’ll start by saying that this is one of those movies that it’s best to go into knowing as little as possible about. I personally think most movies fall into that category, but ones like this especially do. So, if you’d rather not read my spoiler-ish discussion of it, just stop at the end of this paragraph, go watch the movie, then come back and finish reading. While not a masterpiece or anything, I definitely recommend it. It’s pretty powerful stuff, whether it’s the cringe worthy moments or the moments that bring a tear to your eye. Kaycee Nicole Swenson. If that name rings a bell, then the events in this movie may not be too surprising to you. Basically, Kaycee was a teenage girl who, years ago, was battling cancer. She had a blog and many followers. Her posts were humorous, touching, insightful, and inspiring. People around the country, and even in other parts of the world, followed all her ups and downs, all the way up until her tragic death. I was one of those people, and even though I wasn’t as invested in her story nearly as much as some others, it was still an interesting story to follow. What makes it more interesting is the fact that Kaycee didn’t actually die. In fact, she never actually existed in the first place. She was originally the fabrication of a young girl who wanted to chat with older guys on the internet. When her mother discovered this, she didn’t do the expected (aka sane) thing and discontinue the ruse. Instead, she took it to another level. A way out of control level. She claims it was all done to tell the stories of various cancer sufferers she had known, but I think she was just crazy. Needless to say, this was a shock to a lot of people. Especially the ones that had had one on one correspondence with Kaycee and had even talked to her on the phone. They were left wondering who the heck they had actually been talking to. And so, that brings us back to Catfish. While not the story of Kaycee Nicole, I was certainly reminded of that story very early on in this movie, as Nev and his filmmaker friends start to unravel the lies they have been told by this family. Nev has started a long distance relationship with Megan, the older sister of the 8 year old Abby. Megan is a beautiful musician, and she has sent several songs for Nev to listen to. But once they discover one of them isn’t her own song at all, it doesn’t take long to figure out that all of the other songs are just stolen from other artists as well. Not just covers, but completely stolen recordings. And that’s just the tip of the ice burg. Nev and his friends decide to pay the family a visit in Michigan, and that’s when things really get weird. And oddly enough, things get pretty touching as well. My skin was crawling at first with how awkward some of the confrontations were, but after a while the situation is revealed to be just so sad that you can’t help but feel at least some sympathy for everyone involved. The other thing this movie does is make you question everything you’re presented with in the virtual world. In fact, at times I found myself even questioning the verity of the movie itself. I’m almost afraid to do some internet research on it for fear that I’ll find out that it was all faked. Would that fall into some sort of sub category of meta filmmaking? Either way, it would still teach the same lesson that the actual story is teaching: trust no one. I think I’ve heard that somewhere before. Assuming the events presented are as they actually occurred…well…then there’s some strange people in this world. But as one character points out, those are the people that make life all the more interesting. Don’t trust anything you read or see on the internet…or hear on the phone. In fact, it’s probably best to just not trust anything at all! I’m going about this entry a little differently than normal. I’m going to tackle two movies at once because I think they make for an interesting compare and contrast case. The two movies in question are Pedal to the Midnight Sun (2006) and 180° South (2010). Pedal to the Midnight Sun is the first documentary produced by the team of J.J. Kelley and Josh Thomas, the same guys that would later create Paddle to Seattle, one of the best movies I saw last year. In Pedal to the Midnight Sun, J.J. and Josh bike across Alaska, from the Pacific to the Arctic Ocean, in order to witness the midnight sun of northern Alaska. They document all of the ups and downs, the beauty of the landscape, as well as its harshness (the swarms of mosquitoes are borderline chilling). In 180° South, we follow Jeff Johnson, an adventurer who, after finding some old 1968 footage of a group of men taking a trip down to Patagonia (southern tip of South America), contacts them and embarks on a journey to Patagonia of his own. Both of these films feature people who enjoy adventures for the sake of adventure. It’s not about just accomplishing some big goal in the end. It’s about all of the crazy stuff that happens along the way. It’s about being in environments that are still hardly touched by mankind. It’s a spiritual journey to discover who you are and what you’re capable of. J.J. Kelley and Josh Thomas just happen to inject a lot more humor and charm into their documentary than Jeff Johnson does in this case. That’s not to say that 180° South isn’t a good movie. It’s definitely worth a watch. But, mostly for the scenery, educational moments, and sense of wanderlust it creates, rather than for its high entertainment value. Pedal to the Midnight Sun, while not as well made or polished as Paddle to Seattle, connected with me more, and managed to really take me along for the ride with these two guys. The experience of watching 180° South was more like that of watching a fictional movie. It’s much more cinematic, less detailed, and rarely did I feel any connection to Jeff on his journey. We didn’t get all that much of a look into his personality or any of the other characters, except for his heroes, Yvon and Doug. After seeing glimpses of them in the 1968 footage, we finally meet them in the last third of the movie, and they actually provide some interesting commentary, and their stories are the most interesting in the movie. While I don’t think Pedal to the Midnight Sun quite measures up to Paddle to Seattle, it’s still a fun ride. It’s clear that J.J. and Josh learned a lot from this first film and used it to make their next one better. Apparently they’re currently traveling down the Ganges river for their next movie, and I can’t wait to see how that turns out. I can’t quite say the same for Jeff Johnson if he decides to make another documentary. I’m sure it would look nice and make me want to be at the various locations it features, but it probably won’t be as memorable of a ride as J.J. and Josh could provide. Claudio: Being considered the worst movie is almost as much a compliment as being considered the best. It means I’ve made an impression. A documentary about the cult phenomenon that is Troll 2. It’s not an easy movie to describe, this Troll 2. It pretty much needs to be seen to be fully grasped. Oh, and it has absolutely no connection to the movie Troll, other than the title. The creatures in it aren’t even called trolls. They’re referred to as goblins. But that’s the least problematic thing in a movie that has become known as one of the worst ever made. Its cult status has grown over the years, to the point that people have big parties and showings where costumes are worn and scenes from the movie are acted out. Yet, I do understand the fascination with the movie. I like entertainingly bad movies, and I’ve seen Troll 2 several times. I’m not sure I’d want to dress up as characters and act out scenes, but attending a showing of it with an appreciative audience might be fun. It’s certainly fun for George Hardy, the lead actor in Troll 2 and the main focus of this documentary. He’s a beloved dentist in Alabama now, but he’s still a ball of energy that comes alive even more when he’s in front of his adoring fans. He and the other actors that are tracked down from the movie are all kind of pleasantly surprised by their stardom amongst these fans. Though, after a while, we do see them grow a bit tired of it all. 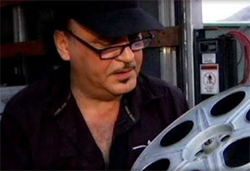 One who is not so amused is the director of Troll 2, Claudio Fragasso. At first, he doesn’t understand that the new popularity of the movie isn’t because it’s so great, and watching that rude awakening is kind of uncomfortable. In fact, there’s quite a few uncomfortable scenes to watch in this documentary. More than one cast member from Troll 2 seems to be a little off their rocker, and seeing them interviewed helps you understand one more reason that that movie is so insane to watch. I’d say that most people could find something interesting in this documentary, but it will be most enjoyable to those who are fans of Troll 2, or bad movies in general. You get to see a bit of a look behind the scenes at exactly why the movie turned out so bizarrely and how it affected the people involved. Though, similar to how sudden stardom starts to wear thin for George and the other actors, the documentary wears thin a little at the end. Not terribly, but just enough to make me realize that my enthusiasm for Troll 2 was running out and I was ready to move on to something else. Still, it’s a mostly funny, sometimes sad, sometimes weird, often fascinating look at what it took to make something truly, memorably awful. Now I’m off to go work on a documentary of my own, Worst Worst Movie (The story of Manos: The Hands of Fate).